A young family has begun selling the first year-round, locally grown commercial produce in the unforgiving climate of Unalaska in the Aleutian Islands. Aleutian Greens co-owner Blaine Shaishnikoff said last week that two storms had just blown through the community — and the lettuce and herbs, nestled inside shipping containers set up as hydroponic farms, were unscathed. "You wake up and there's a couple inches of snow on the ground, and it kind of makes you think about it for a minute," Shaishnikoff said. Shaishnikoff, 28, and his wife, Catina, grew up in Unalaska, the treeless island community where fresh produce is shipped in from Seattle, more than 2,000 miles away. "It takes a lot of shelf life off of the product," Shaishnikoff said. Sometimes grocery stores run out of certain vegetables. Members of the community have long discussed how fresh produce is hard to come by, he said. 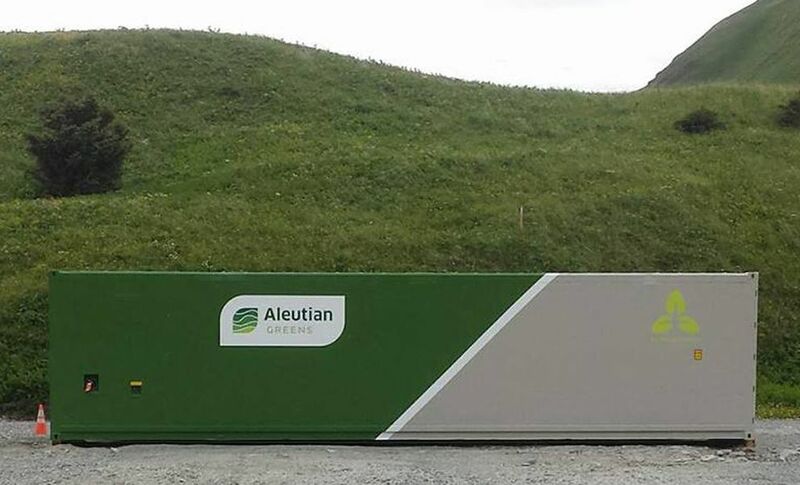 The Shaishnikoffs started Aleutian Greens with funding from the Aleutian Housing Authority. The plants are grown hydroponically inside standard shipping containers. Each shipping container measures 40 feet long, 8 feet wide and 9 feet 6 inches high. A single container can produce 450 heads of lettuce every week or combinations of leafy greens and herbs. So far, the butterhead and green leaf lettuces have been popular, Shaishnikoff said. They are also growing parsley, dill, arugula, kale, chives, basil, thai basil, cilantro, bok choy and mizuna, a spicy mustard green. Since its first harvest Oct. 28, Aleutian Greens has been selling to the Grand Aleutian Hotel and Harbor View Bar and Grill for their restaurants. In January, the company will expand its reach, and Unalaska residents will be able to buy the produce at Alaska Ship Supply, one of two grocery stores in town. "Being able to buy and sell locally grown fresh produce is something that you never even thought would be an option in the Aleutians," Bob Owens, Alaska Ship Supply owner, wrote in an email. Unalaska's 4,400 residents live about 800 miles southwest of Anchorage. Imported produce takes two weeks to arrive from Seattle, Owens said. With Aleutian Greens, the store will have the produce on the same day it is harvested. Owens wrote that the prices will be comparable to produce already on the shelves. 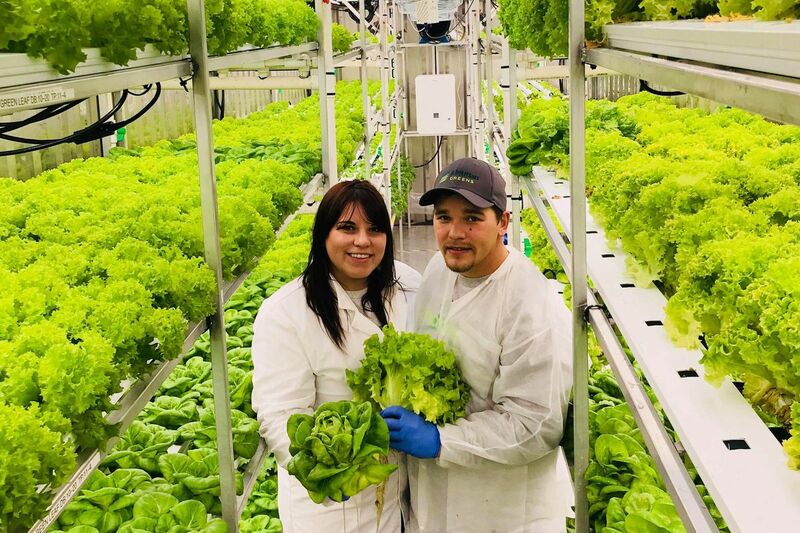 The growing units came from Anchorage-based company Vertical Harvest Hydroponics, which specializes in creating vertical farms in shipping containers. Why shipping containers? Cameron Willingham, Vertical Harvest Hydroponics founder and Chief Technology Officer, offered two reasons. First, shipping containers are tough — "pretty much bombproof" — which makes them ideal for rough conditions, Willingham said. Second, the farms must be small enough to fit on a barge or plane to be shipped to rural Alaska. The hydroponics systems are set up for quick-cycling plants like herbs and greens. "We never set out to compete with carrots or potatoes," Willingham said, which can be stored longer. "We set out to go after the crops that just don't travel well, that just don't grow in the winter up here, that just don't store," Willingham said. The two containers sit on land owned by the Aleutian Housing Authority that was previously vacant – and happens to be a "stone's throw" from Shaishnikoff's house, he said. So far, the couple operates the business along with a couple volunteers. Shaishnikoff has kept a second job working at a rock quarry, he said. In late November, a third shipping container was en route to Unalaska that will be used for harvesting and packaging, Shaishnikoff said. "That's really going to benefit us," Shaishnikoff said.